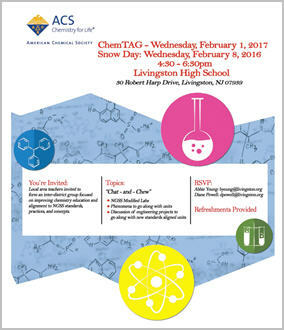 ChemTAG is a discussion group of area elementary school & high school chemistry teachers who gather periodically for sharing ideas and networking. 2. PARKING: Pass the front of the school on the “oval”. Make the first right onto Madonna Drive. Make an immediate right into the staff parking lot. 3. ENTERING THE BUILDING: Enter through the main entrance at the front of the school. You will need to provide photo ID to the security guard who will check you in and give you a visitor’s pass. Once in the building, continue down the short hall past the main office. Make a left. Use the first stairwell (on your left, about halfway down the hall) to go to the second floor. Exit the stairwell towards the left. Make the first left to cross into the “Science Wing”. The meeting is in S23. We will put up signs showing the way. 4. WHAT TO BRING: copies to share of a lesson that has worked well for you.